Happy Tuesday (I hope it is for you, anyways)! This Tuesday was a pretty happy one for me. My Bigs had a great day in school and worked on writing capital “B’s”. I went jogging with my Smalls and there was a breeze (it’s the small things). I made a delicious dinner (my dinner track record of late hasn’t been so great) and I’ll even be sharing one of the recipes soon. 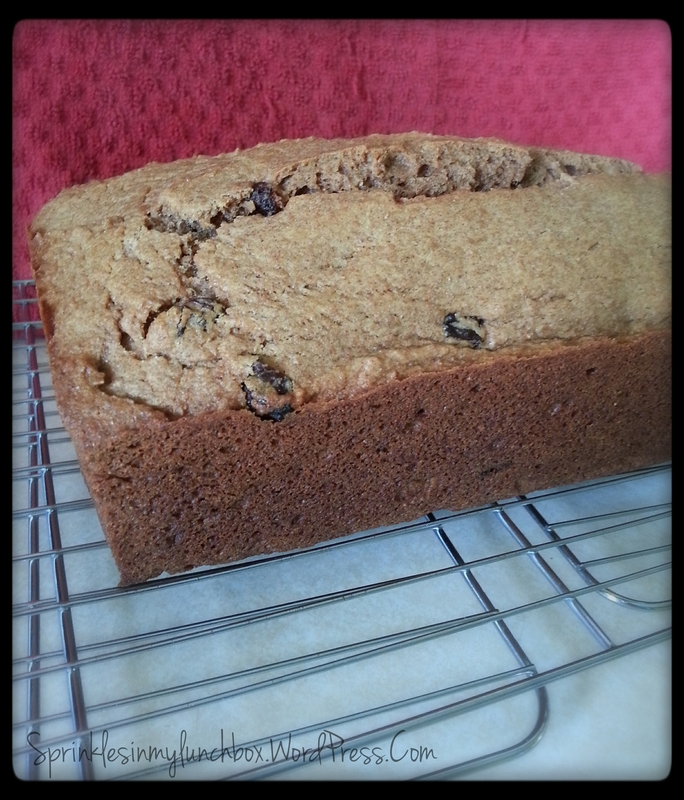 I also made a Cinnamon-Raisin Quick Bread (by Lisa Leake, 100 Days of Real Food). It was a happy Tuesday. I cut one slice of the quick bread and sandwiched it with cream cheese. I also packed one slice of ham, rolled up, and some pieces of cheese, seasoned corn, homemade fruit snacks, and some Sun Drops (colored, chocolate-covered sunflower seeds). I am betting my Bigs will love this lunch. I love the colors of it. So cheerful! 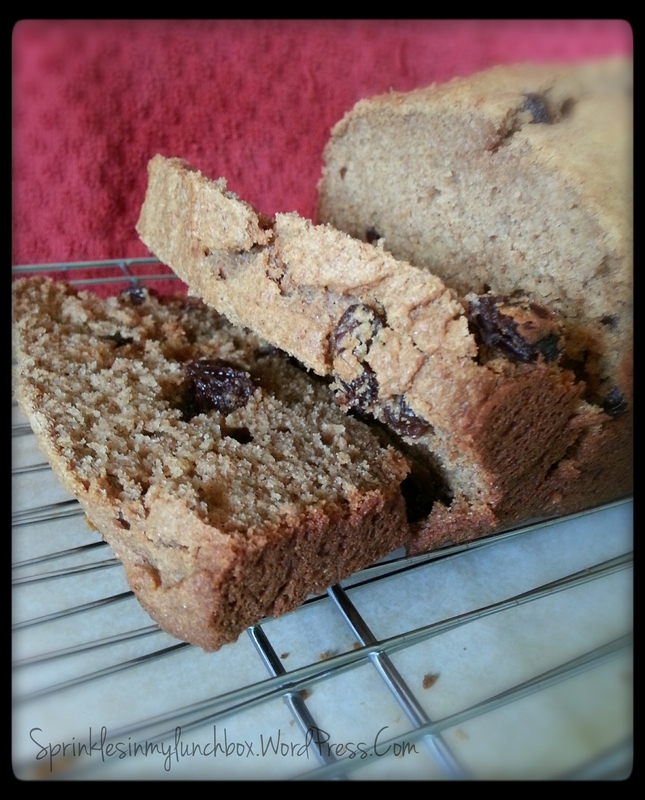 The bread was a breeze to make – it’s not named “quick” bread for nothing! I love 100 Days of Real Food recipes. They are clean and mostly easy. A win-win! The house smelled heavenly while this little loaf was baking. Cinnamon and raisins go so well together in taste AND in smell. 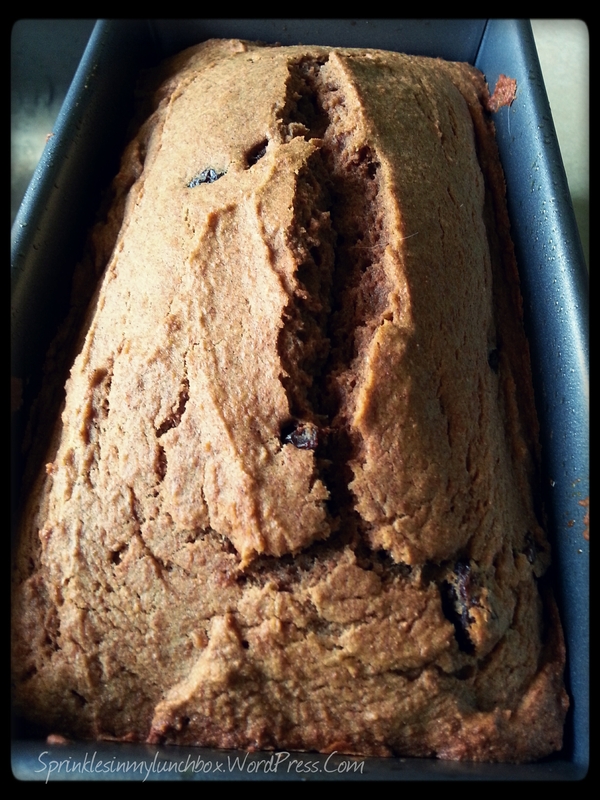 If you’ve got an hour, some whole wheat flour, honey, cinnamon and raisins (and a few other basic ingredients), TRY THIS. There is no white sugar in it – only honey. It’s made with whole wheat. It’s hearty. It’s good hot, cold, or toasted. What’s not to love? I am happy to report that Bigs’ behavior was better today, but unhappy to report that it soured after I already included a lunch dessert in the lunch I just packed for him. As I sit here typing this, and also browning onions for our kielbasa dinner, he is in timeout, thrashing about his room, screaming, and stomping on the floor. I think I felt another gray hair pop up. Since I already packed him a lunch dessert, I am hopping he earns it back. I made a homemade PB&J Uncrustable. I have this little tool that pinches off the crust (and makes it into a square). I love this tool since it doesn’t waste a lot of the bread (only a thin part of the crust). It’s called the Wonder Sandwich Sealer N Decruster. I think I got it at Target on clearance a while back. Anyways, I pressed down the edges with a fork to further seal in the PB&J. I packed my homemade fruit snacks, Goldfish crackers, carrot chips, and three mini homemade chocolate chip cookies. It’s like a little (and healthier!) Lunchable. I really hope his behavior allows him to enjoy his Lunchable as a whole, versus having an empty cookie spot. So yesterday, I got busy in the kitchen. 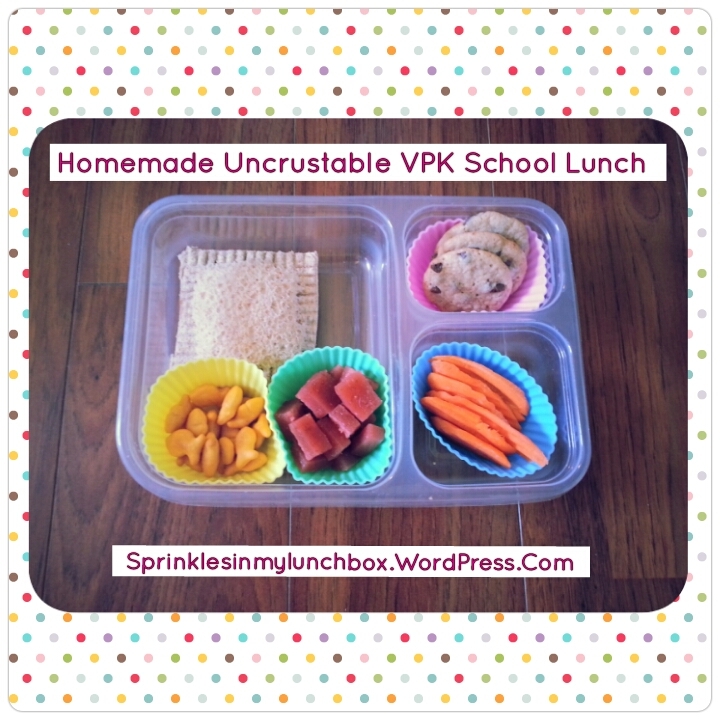 I made three things, that when put together, would make quite a party in the lunchbox! I started with homemade fruit snacks. I’ve made these many, many times before. They are easy and healthy. MUCH more healthy than store-bought fruit snacks (which I won’t judge if you eat them – we do sometimes too!). They only have a few ingredients – frozen (or fresh fruit), honey, orange juice (I use concentrate with water), and gelatin. My Bigs loves these. My Smalls doesn’t adore the squishy feeling. The taste is so much cleaner than the over-processed ones. 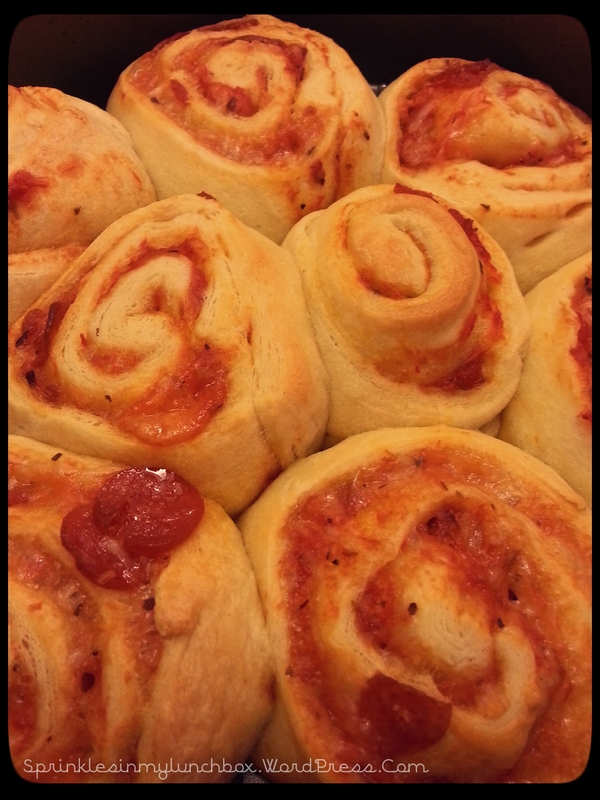 I also made pizza rolls. I didn’t follow any recipe, but made it up as I went along. 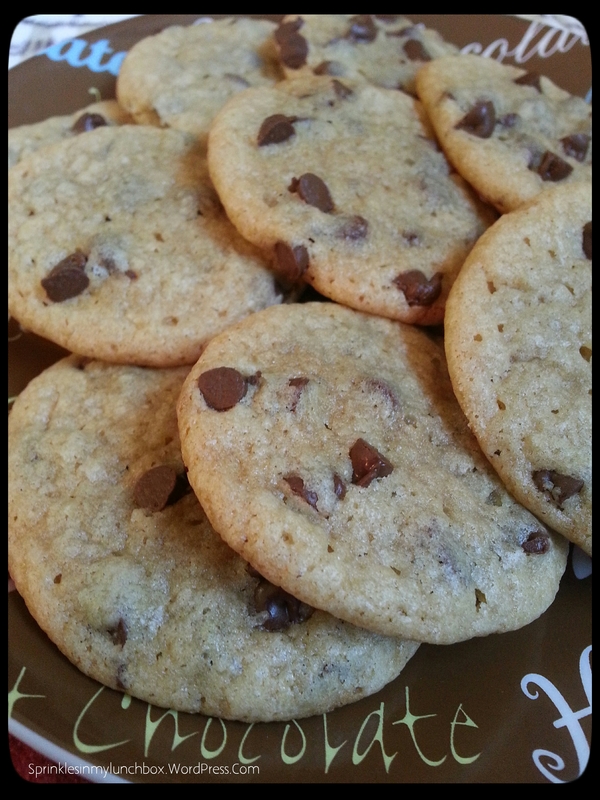 These were also very easy, only using four ingredients, as well. 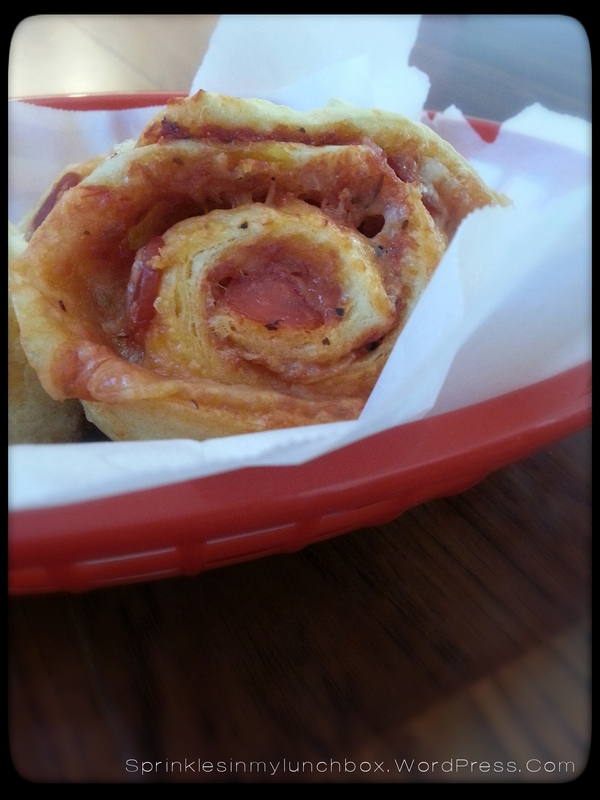 Crescent rolls, pizza sauce, Italian cheese blend, and mini pepperoni. That’s it! 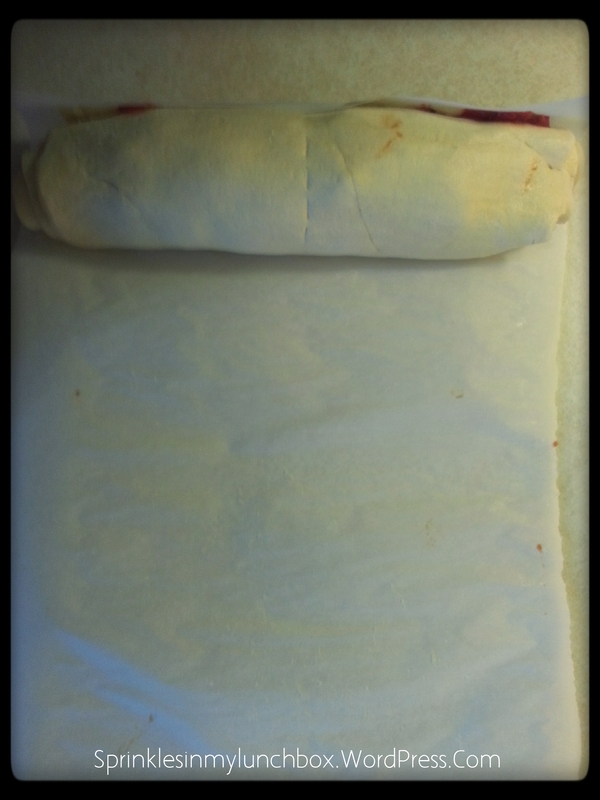 I rolled out the crescent rolls and used a rolling pin to flatten them. 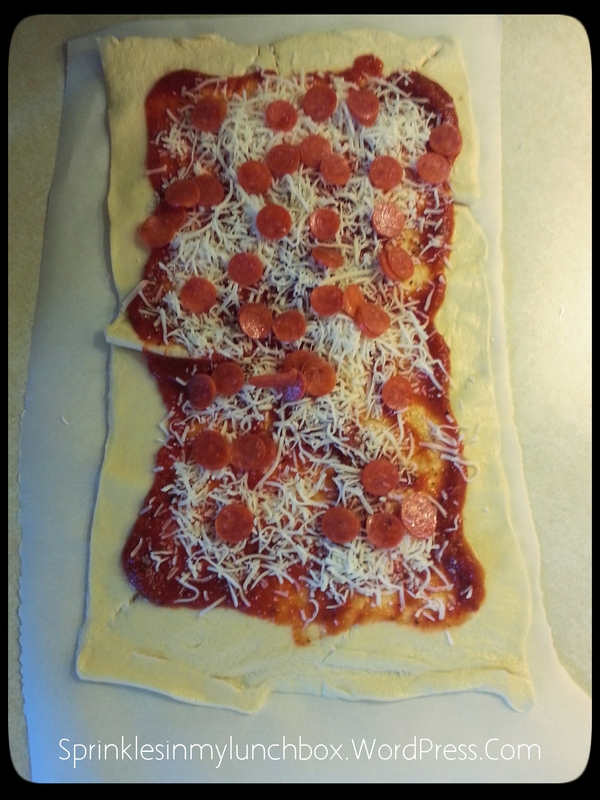 I spread around a few tablespoons of pizza sauce, sprinkled some cheese, and scattered some mini pepperoni. 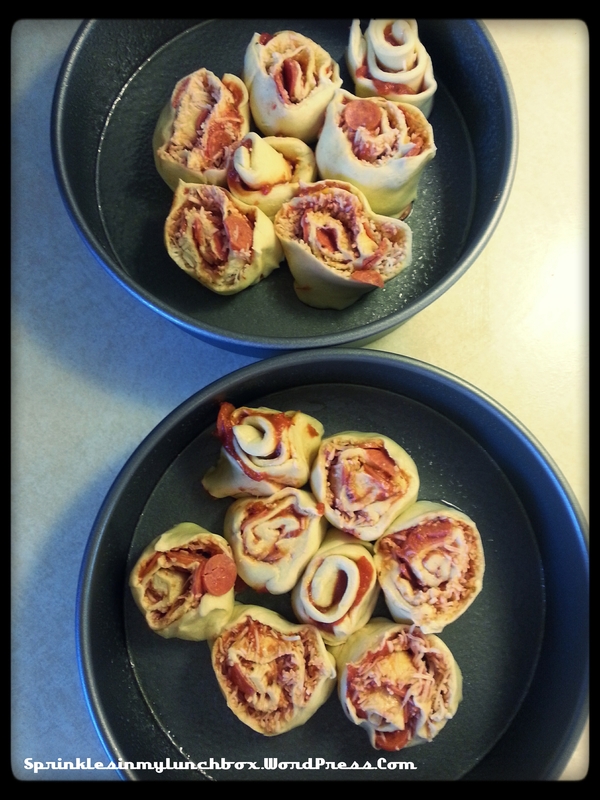 I then rolled up the dough, like I would cinnamon rolls. I placed the rolls in the fridge for a while, so they wouldn’t be too gooey when slicing them. 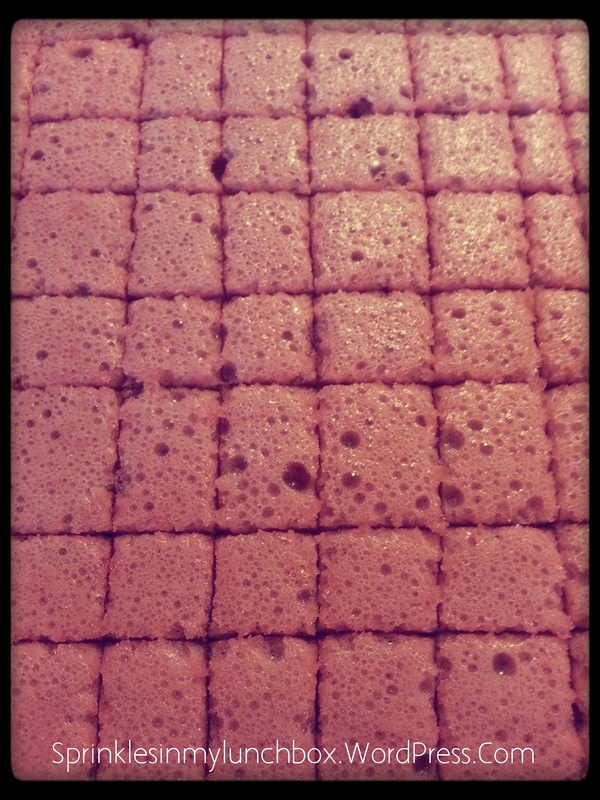 Once chilled, I sliced them and put them in a greased cake tin and baked for about 20 minutes. My house smelled like a pizzeria! They came out golden brown, ooey, gooey, melty, cheesy, saucy, and pizza-y. I think they’ll be a hit. 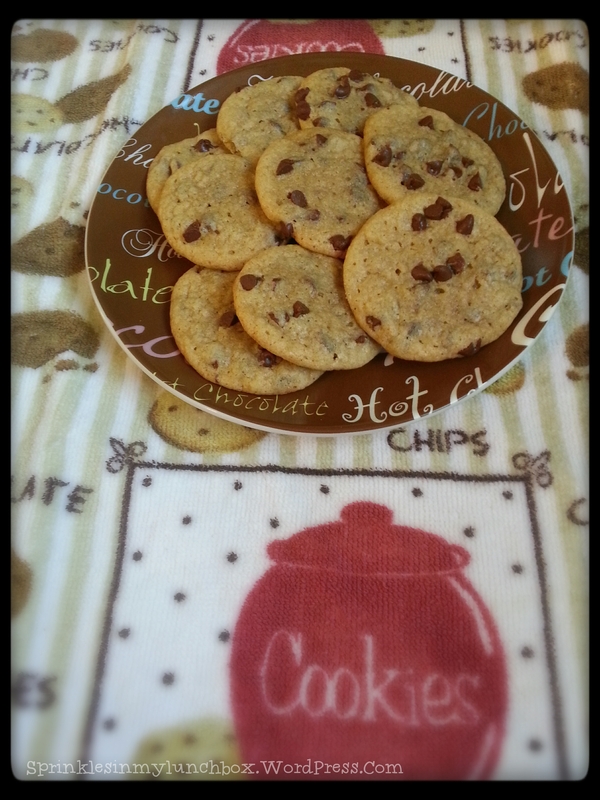 And lastly, I made mini chocolate chip cookies. 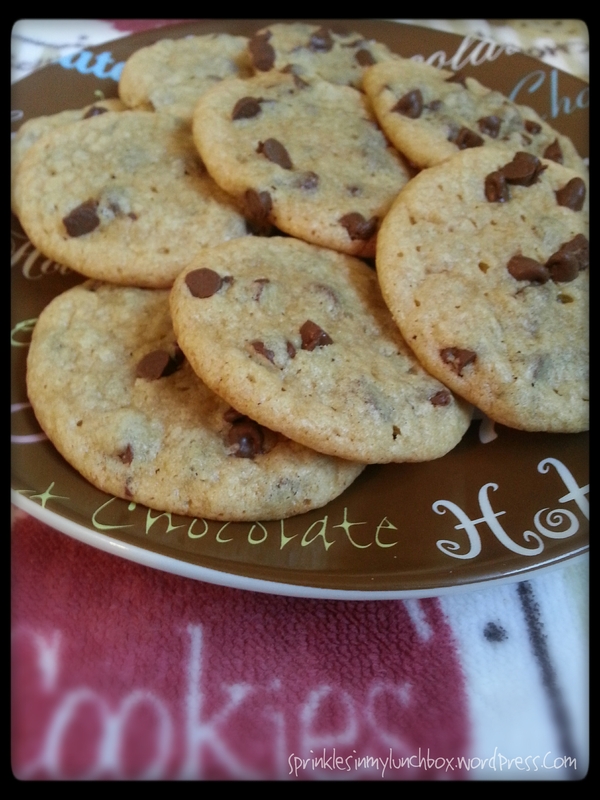 I love any size chocolate chip cookie. These were fun to make. 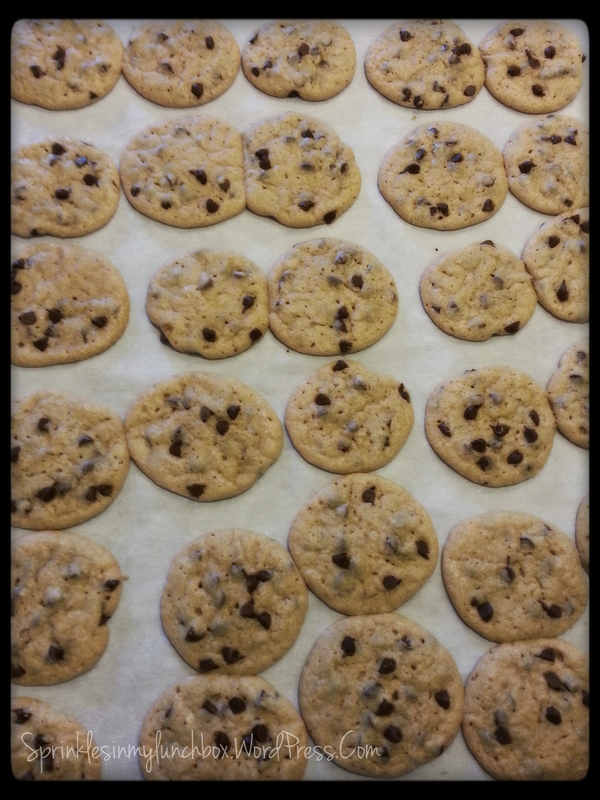 I didn’t even mind rolling up a thousand little cookies. 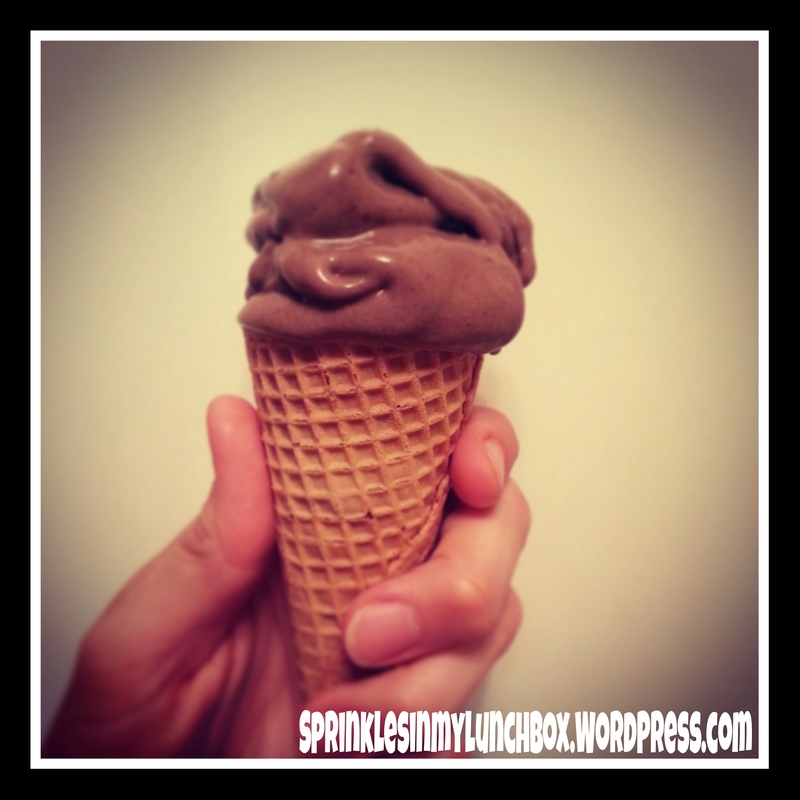 These are the perfect size for small hands and lunchbox treats! I can’t wait for my Bigs to be able to have these in his lunchbox (good behavior is the key to getting these). They are DELICIOUS – slightly chewy, soft, a bit underdone…and best of all, adorably little. Get in my belly, a thousand of you!!! 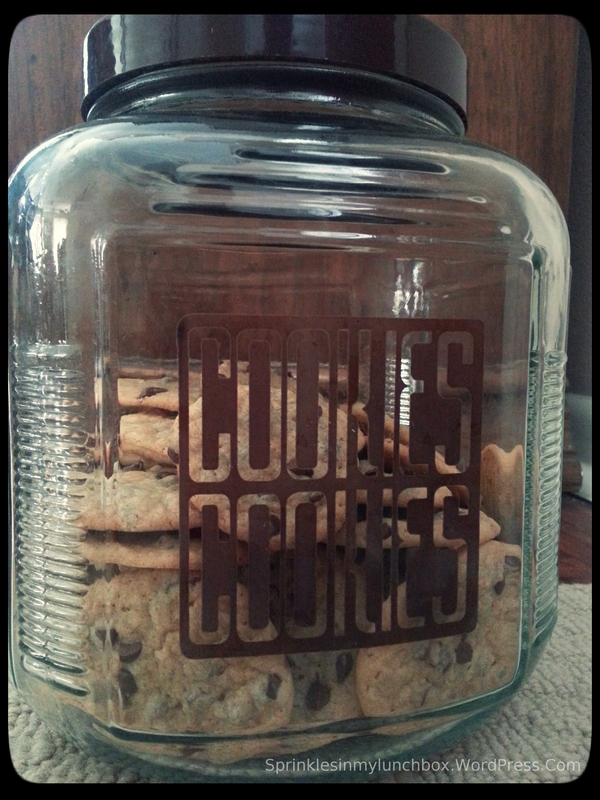 Love a cookie jar full of homemade goodness! Tomorrow is my Smalls’ first day of “school”. 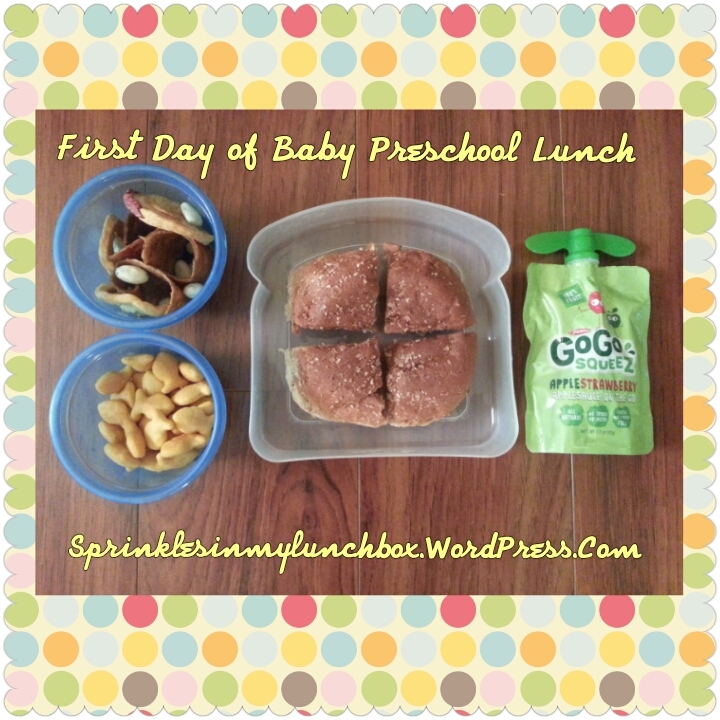 It’s really a pre-preschool, one day a week. He’s so excited about his big boy Mickey Mouse backpack. It’s every bit of 90% his height. It’s too cute. 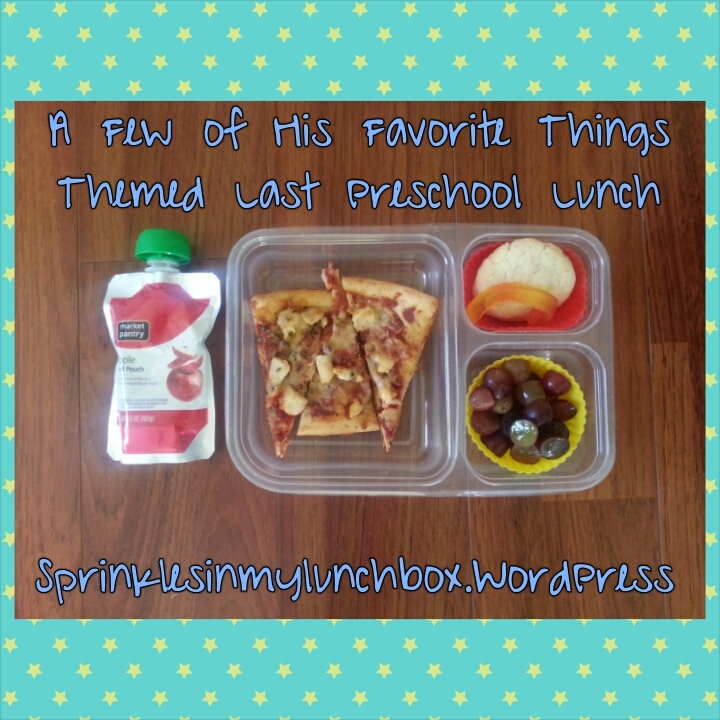 It’s my first official time packing him a “school” lunch! For him, I packed a PB&J on a whole wheat bun, cut into quarters. I also packed an applesauce squeezy fruit, some Trader Joe’s dried flattened bananas that I rolled up, some yogurt raisins, a few dried apples, and some goldfish crackers. I think he’ll love it. My hope is that my baby birdie will eat more than just a few bites. 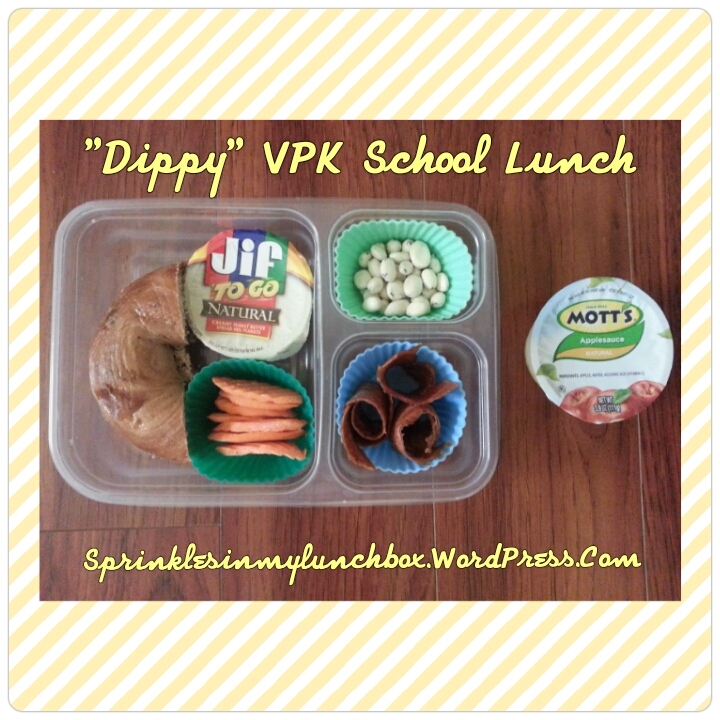 I made a “dippy” lunch. He has half a cinnamon raisin bagel and some carrots to dip into some natural peanut butter, some yogurt raisins, rolled up dried flattened bananas, and an applesauce. I think (hope) he’ll get a kick out of the “interactive” part of his lunch! Have a wonderful Thursday tomorrow! So. We’re back from vacation. School is about to start. Summer is coming to a close. Things are changing. I should be able to keep up with my blog posts now, right? RIGHT?! Right. You guys know I have a serious sweet tooth. It’s well documented. You might not know that I also have a health food tooth (I feel like that’s less sparkly and lovely than a sweet tooth). Is that a thing? I love all vegetables, fruit, tofu, and other healthy fare. Salad is one of my top favorite foods. I love going to salad buffets. And eating all their yummy veg. I even love beets. BEETS. Even as a kid I loved them. If you don’t like them, I have recipes that will forever change your mind about them. I went to Trader Joe’s this past week to try their healthier food (and some not so healthy food…blog posts on those to follow). 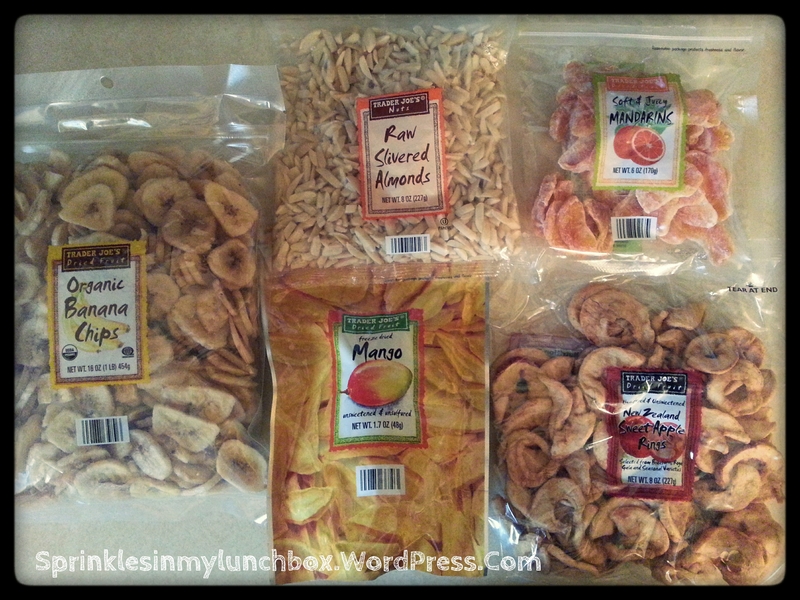 My kids love dried fruit as snacks. My Mom dries her own fruit and it’s delicious. Since I don’t have a dehydrator, I don’t mind buying them (or eating my Mom’s). 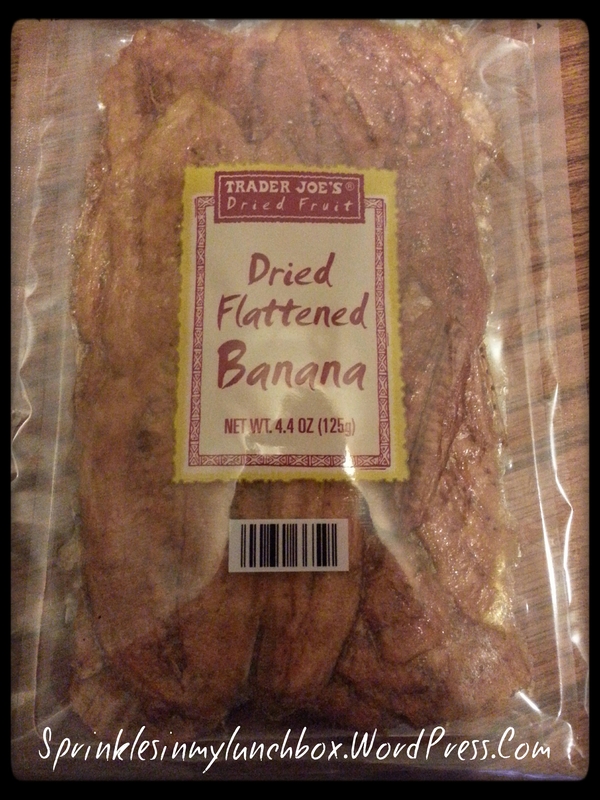 We tried the TJ’s Dried Flattened Banana. I’ve never had this before now. They were really good, like banana fruit roll ups (if you rolled them up). The ingredients were bananas and something to keep them from browning. At $1.29, it was a bargain. Organic Banana Chips: They were good, crunchy, and delicious. Like any ol’ banana chips. They were $2.99 and there were a lot. I’d call it a deal. Dried Sweet New Zealand Apples: These were delicious. Despite only having apples (several different varieties) as the only ingredient, when I opened the bag, they smelled like fall. They were chewy, moist, and full of apple flavor. And the bag wasn’t skimpy on quantity. Also priced at $2.99, I think they were a deal. Dried Fruit Mandarins Soft & Juicy: I’ve never had these before either. These were the only dried fruits we tried that had sugar as an ingredient. I’d serve these more for a lunch dessert. When I opened the package, the fresh, bright, citrusy scent of mandarin oranges hit my nose. The flavor copied that. They were delicious and sweet. They cost $2.69. I’d get them again. Freeze Dried Mango: The only ingredient was mango. I like to see that. They were crunchy and yielded a nice bite, but also melted in my mouth (like most freeze dried fruit). They were also delicious. They also cost $2.69. Lastly for the fruit and nuts category, we got some slivered almonds. They were delicious and like any other slivered almond. I like to put these on my oatmeal and in granola bars. I got quite a bit for $3.69. I’d get all of those again. 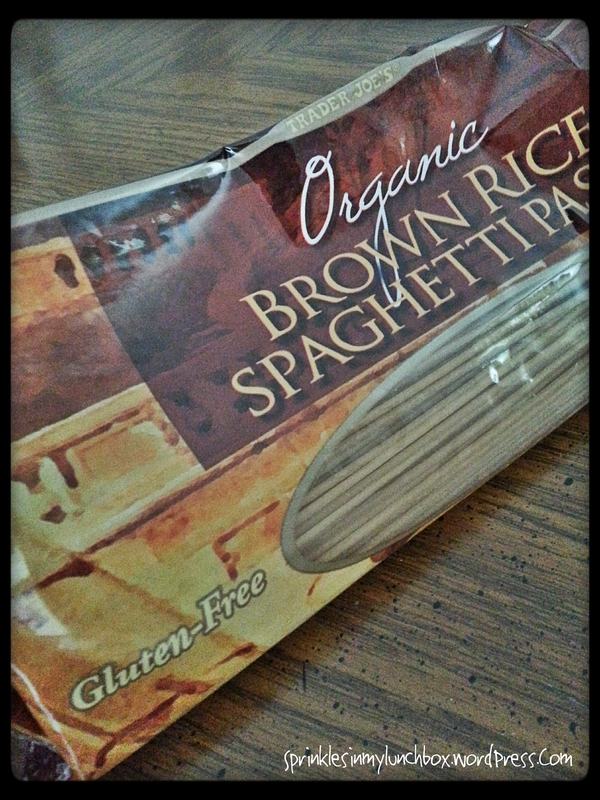 I also picked up some gluten free pasta. Trader Joe’s has a good selection of such pastas. They offer both brown rice and corn pastas (perhaps more, but those are all I looked for). They had different shapes too – fusilli, penne, spaghetti. It’s great to see GF pasta becoming more mainstream. I picked up a box of brown rice penne, brown rice fusilli, and brown rice spaghetti. They were $1.99 each (which is comparable to Aldi’s and far better than grocery store prices). 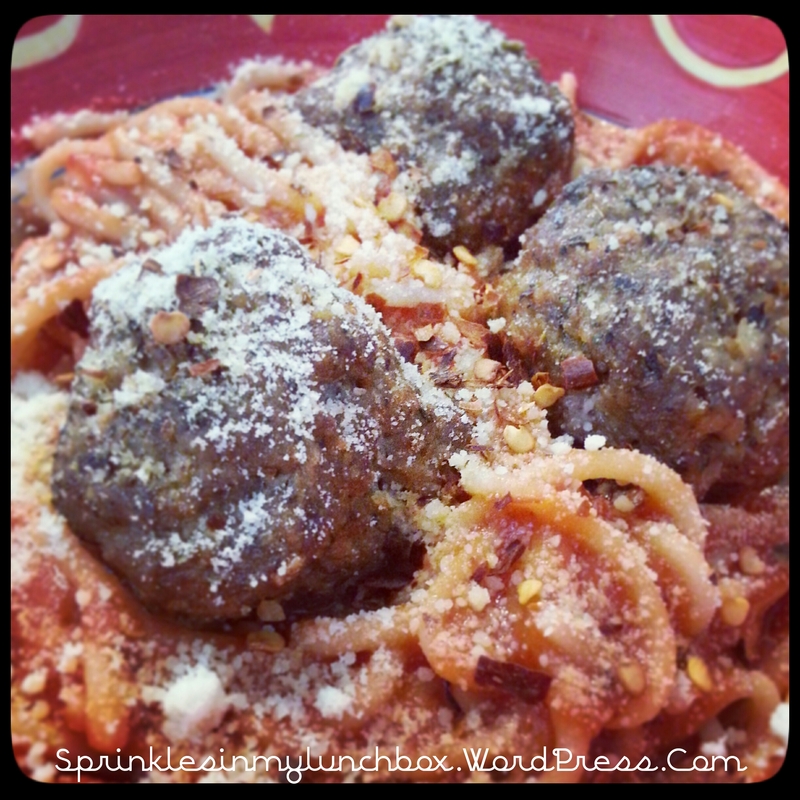 A few nights ago, we tried the brown rice spaghetti. It was delicious. I love that they give you a whole pound. 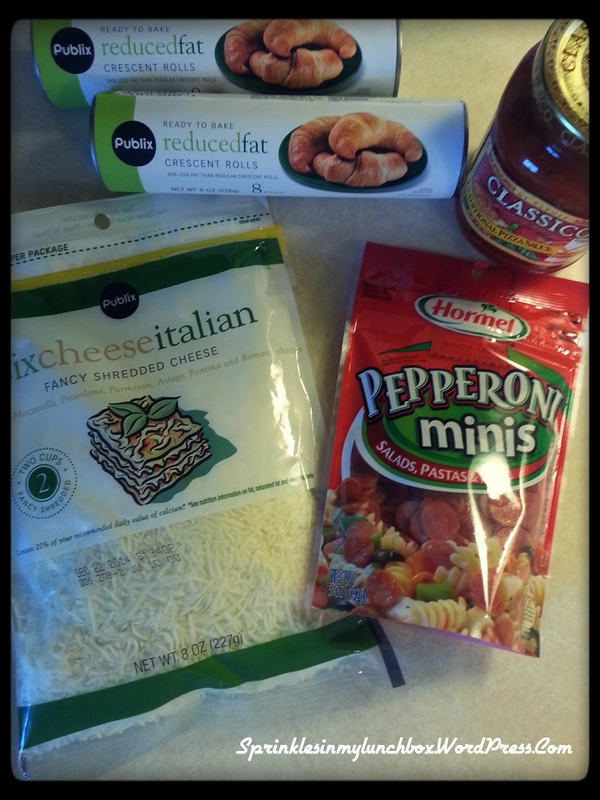 Some GF pastas come in smaller packages. It was nice to feed the whole family from this (very cheap for GF) pack. It was delicious. We really couldn’t tell the difference between this pasta and flour-based pasta, in the best way possible. It’s a must-buy for us now. I also restocked my TJ’s sprouted tofu. I can’t wait to eat that. It, too, was delicious, the last time I made it. Enjoy your day, go hug a tree, and eat something healthy! It’s almost snack time around here. My boys live for snack time. They act like I didn’t feed them a well-rounded breakfast, small snack and lunch just before. Do you ever run into the old what-do-I-feed-“them” routine? Sometimes, I’ll serve them fruit. 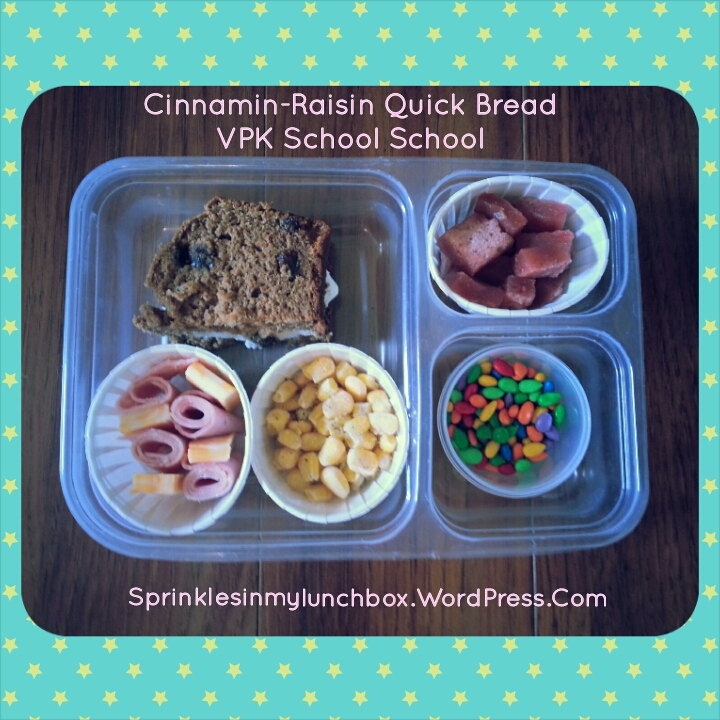 Other times, they have store-bought granola bars (sometimes I make them from scratch, but other times, ain’t nobody got time for that), raisins, yogurt, or applesauce. 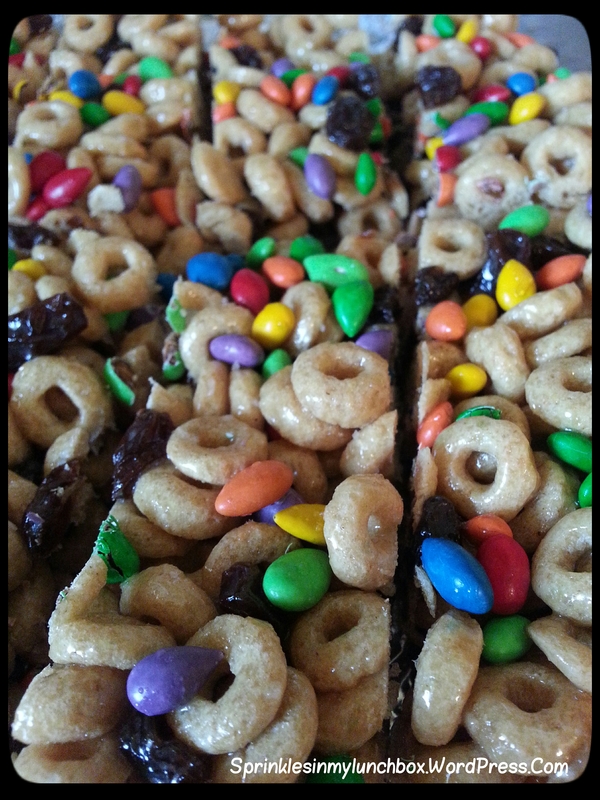 And, sometimes, I will make a snack with them that will sort of go with one of the library books we’ve checked out. It’s fun to tie together snacks and books. Welll, today, this didn’t happen. But I already know what I’ll be feeding the boys for snack. 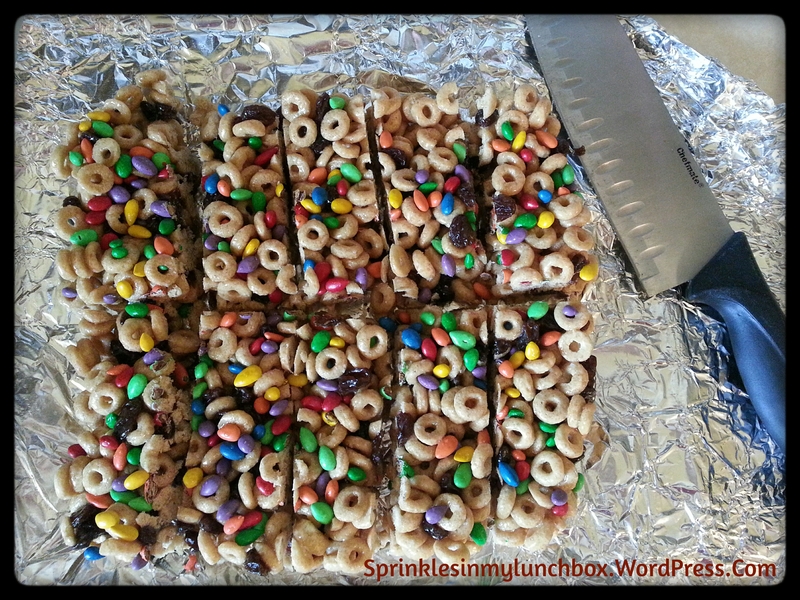 I made no-bake Cheerios bars for them, earlier in the week. They came out so pretty! It was a wickedly easy recipe, and for once (or twice, but that’s it, tops), I had all the ingredients, even the chocolate covered sunflower seeds! Orange you glad I didn’t say “bananas”? I just taught this joke to my four year old. He is super into jokes right now. It’s really cute. He never waits for you to say “Who’s there?” and he always changes something with the telling of the joke or the punchline. It’s great. 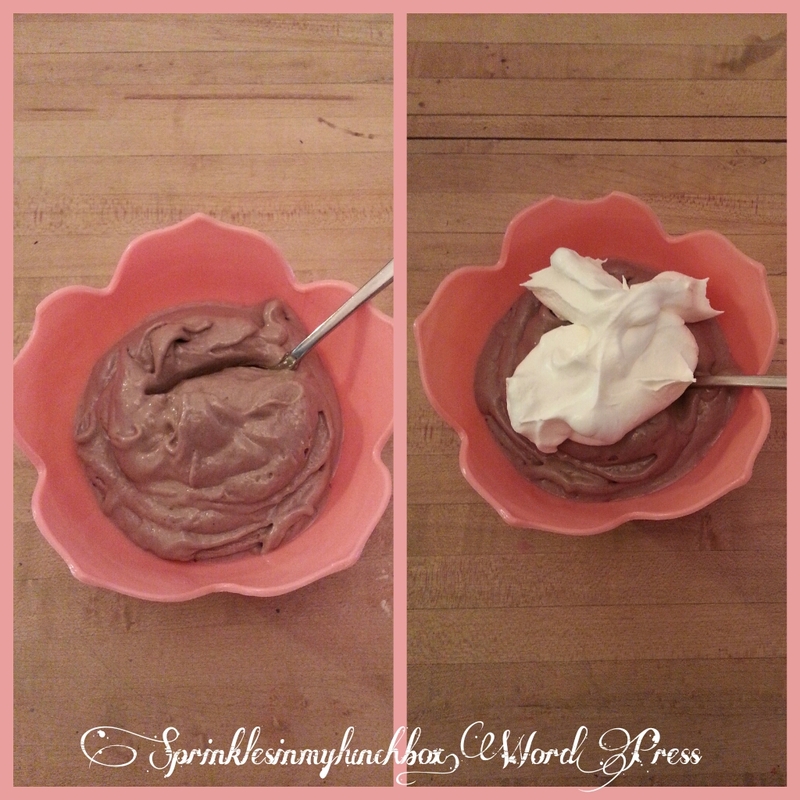 We’ve been making banana “ice cream” a lot lately. Like, more than we should. It’s just so good. I know I’ve posted about it on this blog before. It’s just too easy. And refreshing. And it’s SO freaking hot outside. It’s just bananas, peeled, chopped and frozen and then mixed in the food processor. I’ve been adding dark chocolate cocoa and peanut butter. It tastes like a Reece’s PB Cup, but with a banana. The kids think it’s an extra special treat, and it really is, even though it is entirely healthy and (naturally) sweet. We’ve started going to the library every Wednesday now. Bigs is on a big Berenstain Bears book kick. Smalls is on just a regular leg kick (as in, he kicks everything). And I’ve made it a priority to find some time for myself to read (even if it means I stay up later…no wonder I’m so pooped!). Bigs picks out all the new Berenstain Bears books that he’s not yet read or that we don’t own and I thumb through the shelves, looking for books I think they’d both enjoy. I can’t help it, but I am always drawn to books with some sort of food theme or food title. I can’t help it. I’ve started making snacks that sort of match the food in the books, the best I can. It’s been an unplanned, fun, activity for both me (making them) and the boys (enjoying them). 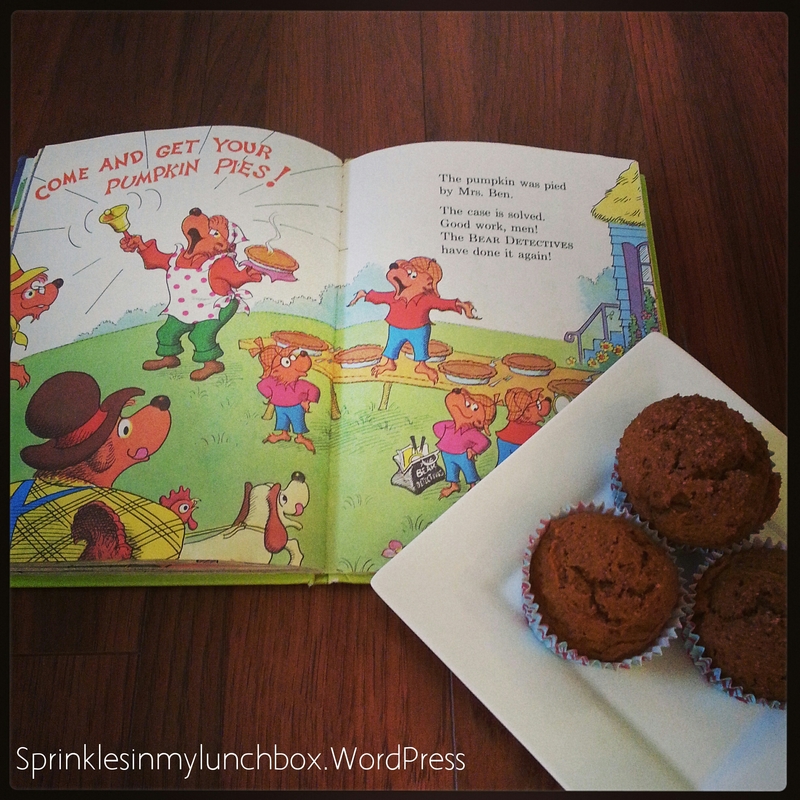 Thus begins my new series, “When Story Time and Snack Time Collide”! 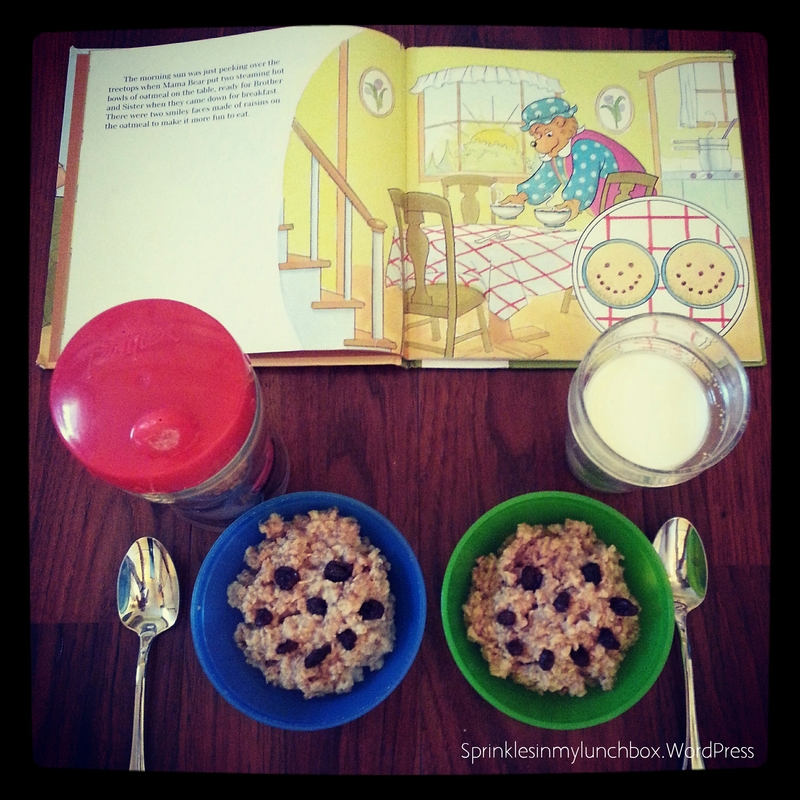 Last week, I made raisin happy face oatmeal to match the raisin happy face oatmeal Mama Bear made her cubs. Bigs went bananas. Smalls didn’t care. I had enough enthusiasm for him though, not to worry. Today, we read The Bear Detectives and at the very end, the cubs found out that the missing pumpkin was made into a delicious pumpkin pie. Since I didn’t have enough time to just whip up a quick pumpkin pie (nor did I feel that was a healthy enough snack for them…for me? that’s a different story! ), I made pumpkin muffins. 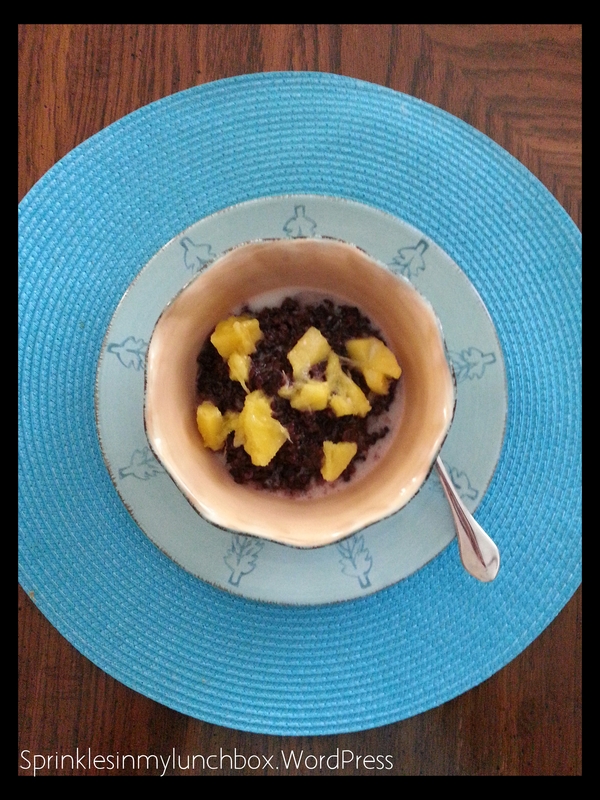 I found an easy, one-bowl recipe on one of the blogs I follow. And they were healthy! The only change I made was that I replaced part of the honey with some demerara raw sugar, since I didn’t have the amount of honey it called for. It’s not quite nap time yet (waaaaahhh), but the boys are already looking forward to their pumpkin muffins while reading our new library books! 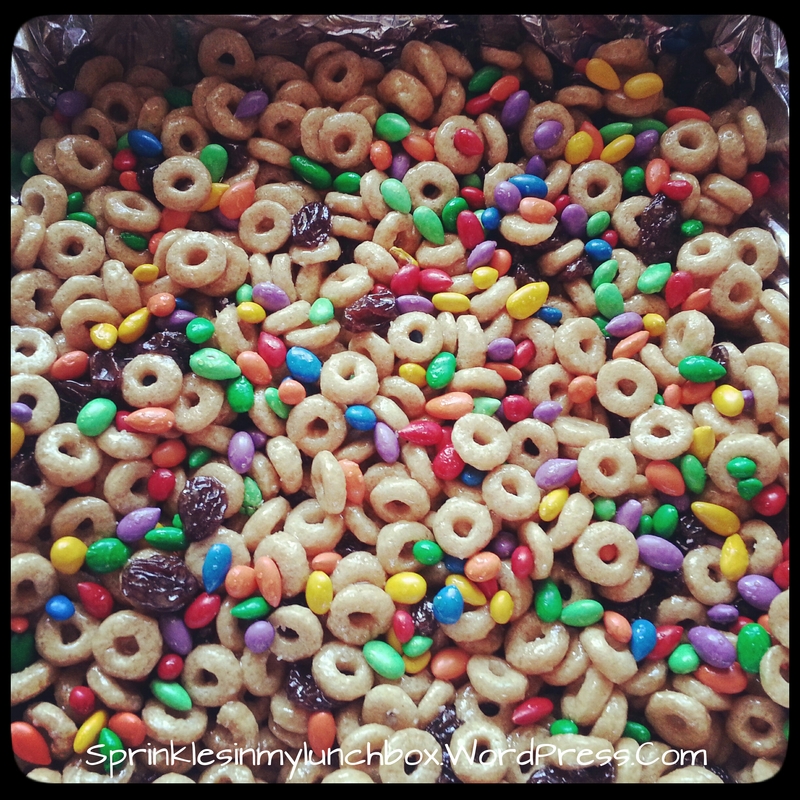 Enjoy eating these with your own little cubs! I have a TON of cookbooks. I’d like to think that I collect them. I’m sure a lot of my foodie friends out there can relate. I could just sit for hours, thumbing through my cookbooks, gazing upon those glossy pages, my eyes skimming the ingredients, my mouth watering over the perfectly styled pictures. I know that the internet provides a quicker, easier way to look up recipes…but to me? There’s nothing like holding a cookbook in my hand, flour dusting the pages, the smell of a real book (I’m also a real-book-reader, as opposed to giving into a digital reader…is that even what it’s called?). A week or so ago, I was reading my Vegetarian Cooking: A Commonsense Guide and found a recipe for which I had all the ingredients. Put the rice in a large non-metallic bowl and cover with water. Let it soak overnight (or a minimum of 8 hours). Drain the rice and place in a saucepan with 4 cups of water. Bring to a boil. Cook on a low boil, stirring, for 20 minutes. Drain. *I skipped this step* Pull your fingers through the pandan leaves to shred them. Tie them in a knot. Pour the coconut milk into a large saucepan and heat until almost boiling. Add the pandan leaves and the sugars and stir until the sugar has dissolved. Add the rice and cook, stirring, for 8 minutes (no boiling). Turn off the heat and let it sit for 15 minutes. Remove the pandan. 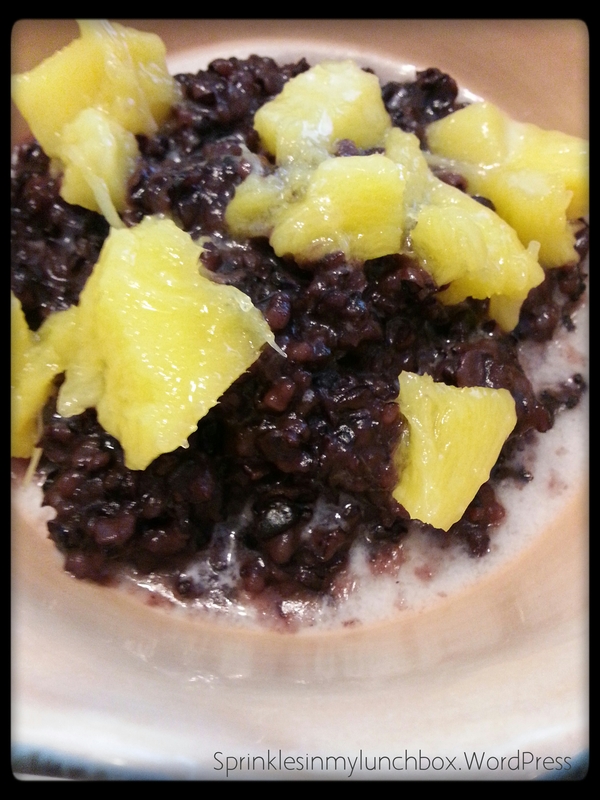 Spoon into bowls, and serve warm with coconut cream and mango. PS – More bloggy blog posts to come! Today is my Bigs’ last day of age 3 preschool (next year will be VPK). I am so proud of how far he’s come this last school year. We will miss our school routine, his teacher, his classmates, and their Mommies. It’s been a wonderful year. I am so grateful for his school. Today for lunch, I packed “Bigs’ favorite things”. I packed some pizza (BBQ chicken pizza from Aldi), an applesauce squeezy fruit, some red grapes, and for dessert, a sugar cookie and a gummy worm. I also packed a no-sugar apple juice box. He loves those, but they are very rare, so it will be a treat. 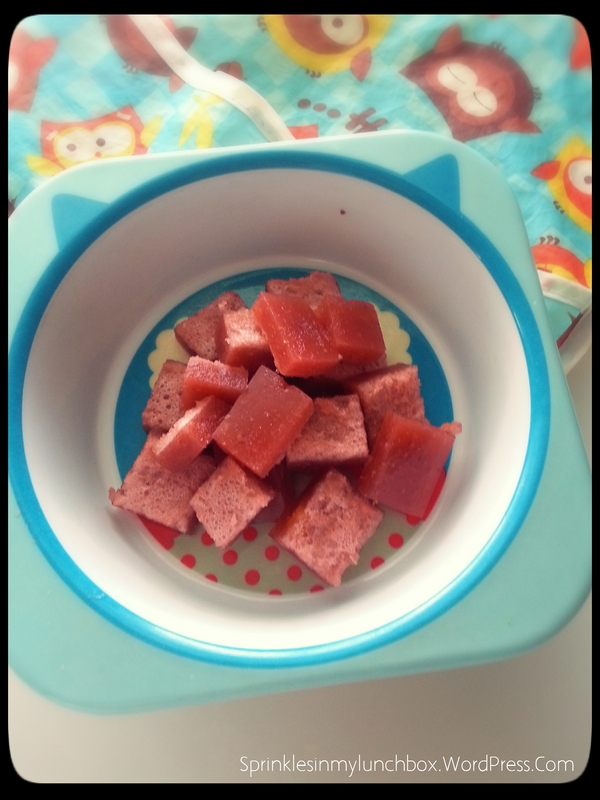 For his snack, I packed fruit snacks and shrimp chips (weird, but both my boys love those! ), two of his favorite things. Wow, what a year of lunches, too! Next year, Bigs will be in school 4 days a week (versus the two this year). I will definitely have to get my thinking cap on. Yikes.